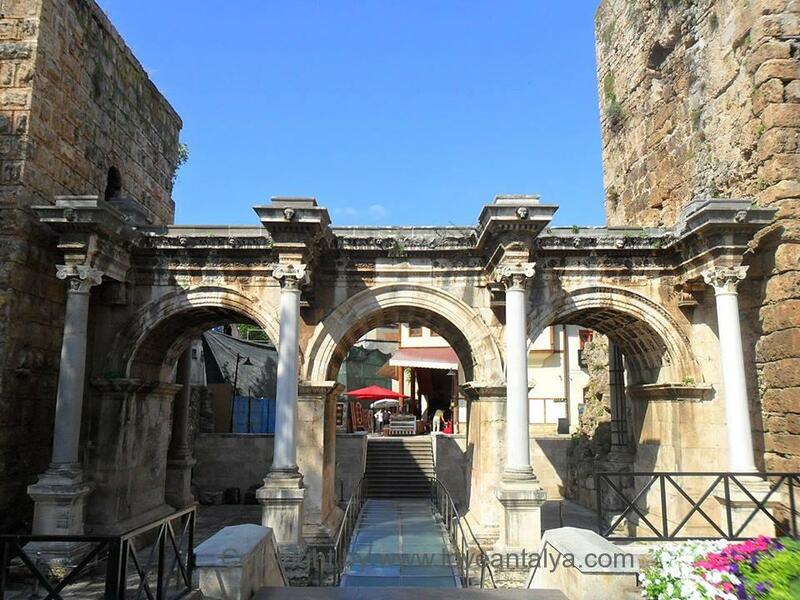 Hadrian’s Gate or Hadrian Kapisi, as it’s called in Turkish, is a beautiful Roman triumphal arch that was built when the Roman Emperor Hadrian visited Attaleia (the old name for Antalya) in year 130 AD. 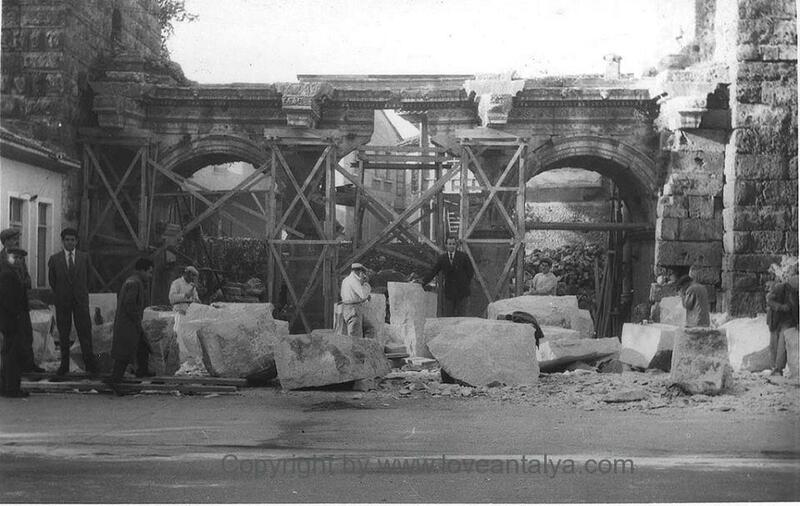 The gate marks the entrance to the old town Kaleici from Atatürk Caddesi. You can find many other entrances to the Old Town, but this is the only gate which still remains, and it is considered one of the most beautiful of the time. You can easily imagine that in ancient imes, the old town was sourrounded by a massive stone wall that served to protect the city from invaders and pirates. 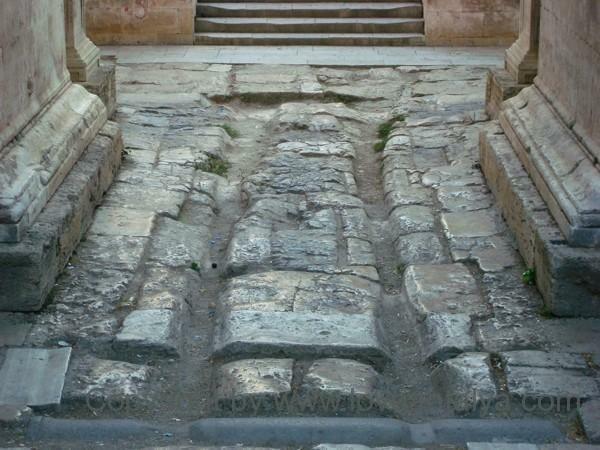 In many places, the walls are still well preserved and especially Hadrian’s Gate is in good condition, although it was proper restored as late as in the 1959th. I don’t remember the year exactly, but I dare say, that the gate also has been restored over the last 10-15 years. The first time I visited the arches, it was a little difficult to step through the gates, because of the deep furrows in the copplestones after carriages and vehicles had entered it in millennia. The tracks have recently been covered with a transparent glass to preserve them and to make life easier (and safer) for the pedestrians. 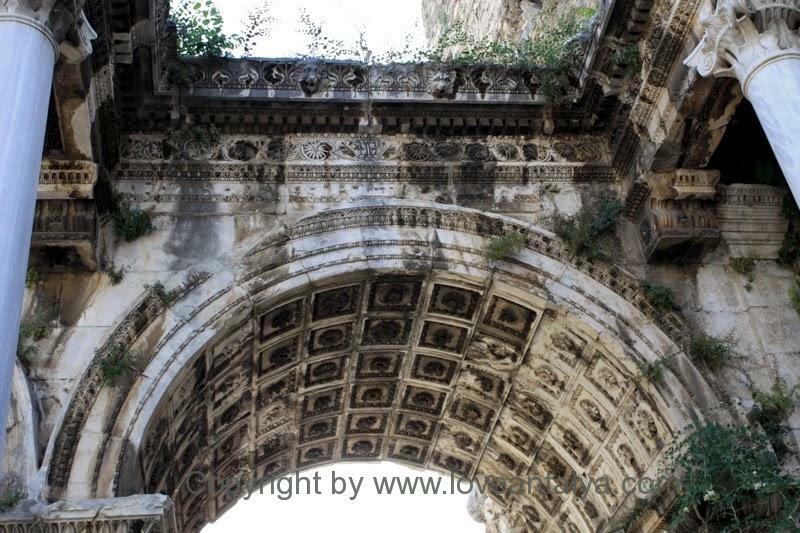 The port consists of 3 large arcs with pillars, towers on each side and remarkable carvings. It is built of white marble while the pillars are of granite. 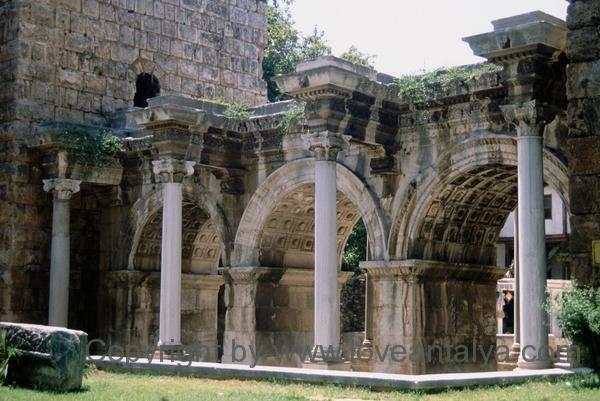 Like many other places around Antalya, one is not in doubt of the Roman influence in the area. There is massively many buildings and ruins, that is so beautifully decorated and carved. Something I always find very fascinating (perhaps because I come from the cold North without the great Roman gestures). To read more about the architecture, I can recommend this page. You might not be that interested in history or the gate, but still I’ll recommend you to drop by. It is one of the major “must-sees” in Antalya and it can easily be combined with a trip up and down the shopping street Atatürk Caddesi or a visit to the old town Kaleici. Behind the arches and in the Old Town on the street Hesapci Sokak you will encounter nice local shops and many excellent guesthouses.